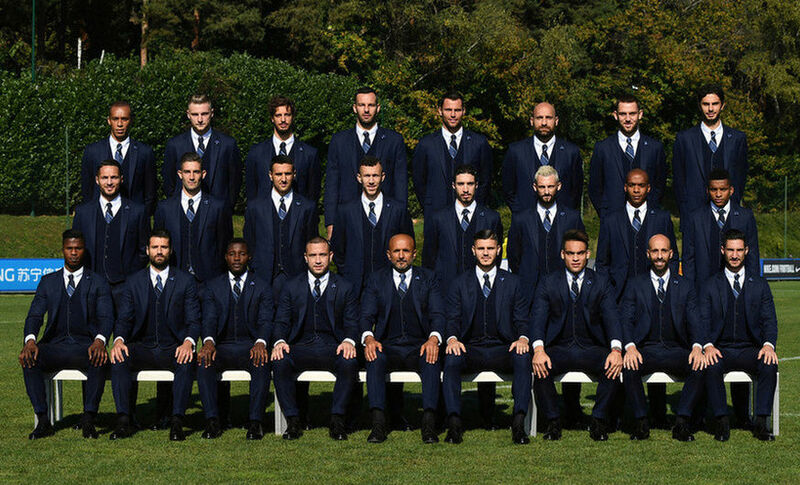 MILAN – Brooks Brothers, Inter’s Official Formalwear and Footwear Partner, will provide the Nerazzurri players’ attire for the sixth consecutive season, with the historic New York clothing brand supplying the Nerazzurri's players and directors with their official outfits. New this season: the suit being provided by the Brooks Brothers is a blue pinstriped Regent suit in 100% wool, woven in Italy, with a single-breasted jacket with two buttons – always a must for the brand. The classic white button-down non-iron Oxford shirt in Supima® American cotton is combined with a double-face waistcoat in 100% Merino wool with horn buttons. The outfit is completed by the regimental tie – a hallmark of Brooks Brothers – in Made in USA silk in three shades of blue, a reference to the team’s colours. It also includes the logos of Brooks Brothers and Inter. The five-hole derby shoe is made in Italy from selected French calfskin, naturally tanned. Brooks Brothers also accompanies the team during away games with a casual look: non-iron navy blue stretch chinos for superior comfort, a white button-down non-iron shirt in Supima® cotton and an ultra-fine and ultra-light sweater in 100% Merino wool, with rich textures in shades of blue.